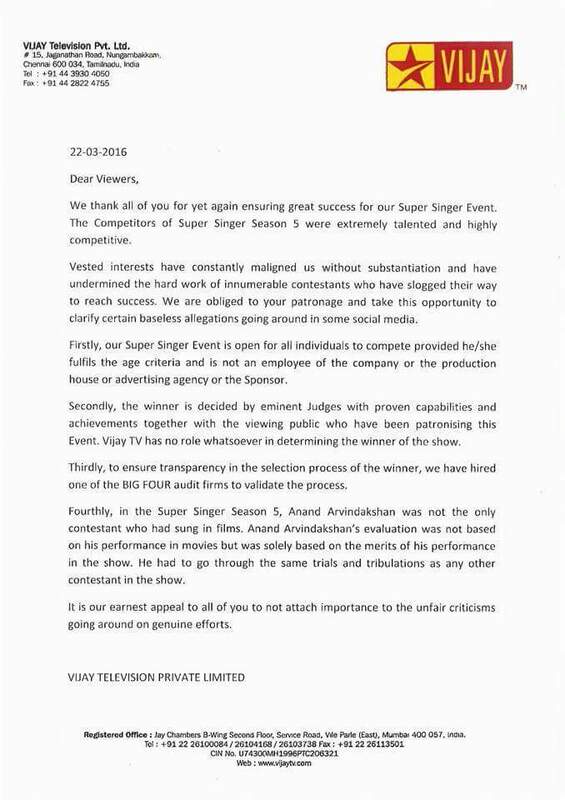 Vijay TV’s Response to Super Singer Winner Controversy: After several speculation about the latest super singer finals Winner, Vijay TV have themselves come up with an official reply to all their Viewers. how stupid, how can a channel go request singers from all the states to come and participate in the competition..and it’s an individual’s wish to participate in a competition. moreover super singer has had contestants participating from different states like kerela, Karnataka etc., and also from other countries as well. Already there are too many other state winners. What do you want? That no Tamil shows should promote Tamil singers is it? So what do local talented Tamil singers do? I hope next season we see more Tamilians participating. Tamil need not give chance to any other state because many other states have their own local singing competition! when people like you after hurting somebody’s feelings so badly are not worried then why should anand be worried? Anand has not cheated anybody. all his profiles, websites contained the information that he was a playback singer. not only me but many supporters of anand know that he has already sung songs in a few movies. Just because he has sung a few songs he is not as experienced as other famous playback singers like SPB sir, that he cannot contest a competition like super singer. there is no rule that a playback singer cannot contest the show. There are contestants of previous seasons who have sung songs in movies before. 1. whether the competition is for finding new / best talents of Tamil Nadu? 2.Can an Amateur / New Talent compete with professional singers? 4Why have you kept Age, employee, Production house to be a criteria? To filter some. So, Should not be Professionalism be a criteria too ? Because, they already know how to win /perform, better than the fellow amateurs.